Warmer temps have finally found their way to New York! 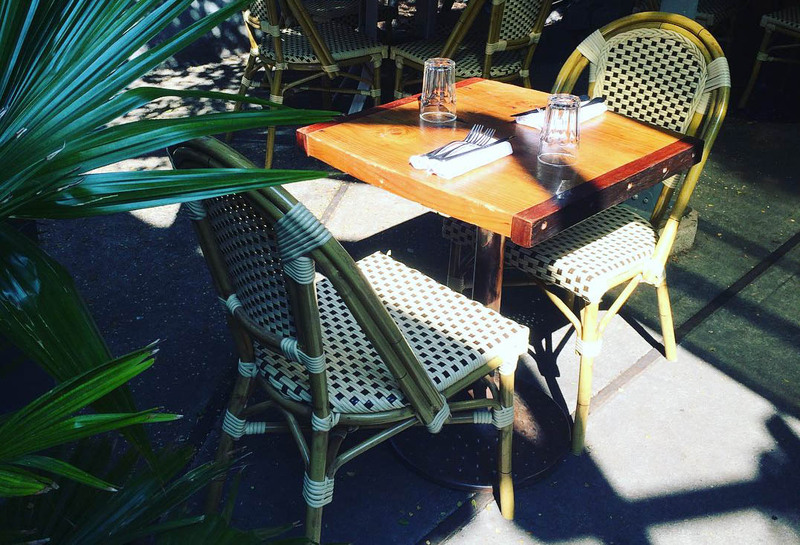 This easy breezy weather is perfect for dining outdoors, soaking up the sun over brunch or surrounding yourself with the romantic glow of twinkling bistro lights over a leisurely dinner. Now’s the perfect time to eat deliciously-crafted food and sip cocktails in an outdoor oasis that makes the hustle and bustle of city life fade away. Luckily, Brooklyn has plenty of wonderful options. Here are some local gems that are definitely worth the trip. 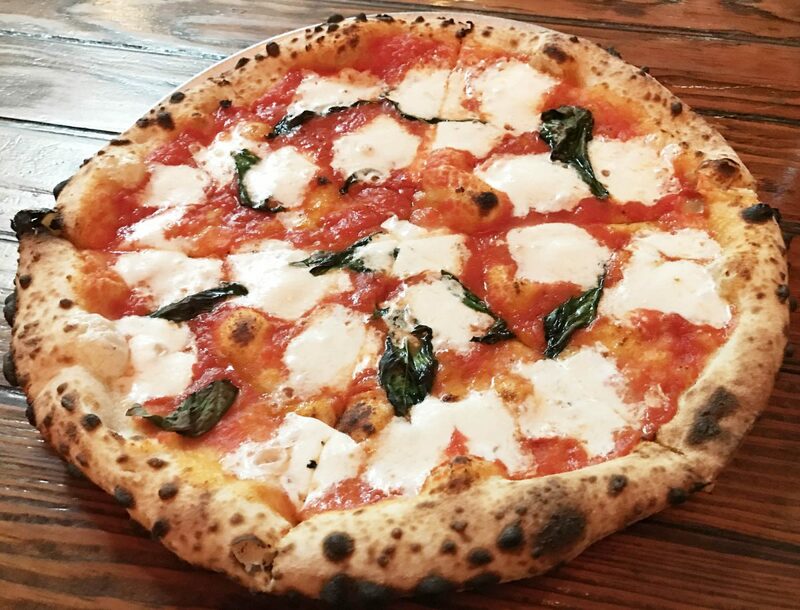 Roberta’s is so good that it essentially put Bushwick on the map, and a community developed around it. The pizzas are perfect – creative yet simple, with a charred but fluffy crust. You must try the savory and sweet Bee Sting. Enjoy every delicious bite in a relaxed garden filled with picnic tables or at the tented and often lively outdoor tiki bar. If you’re not in the mood for pizza, have a drink outdoors on your way to partake in the uniquely fantastic Blanca, Roberta’s unique restaurant-within-a-restaurant, a two Michelen-starred 20-course tasting menu situated at a counter overlooking Roberta’s pristine kitchen. 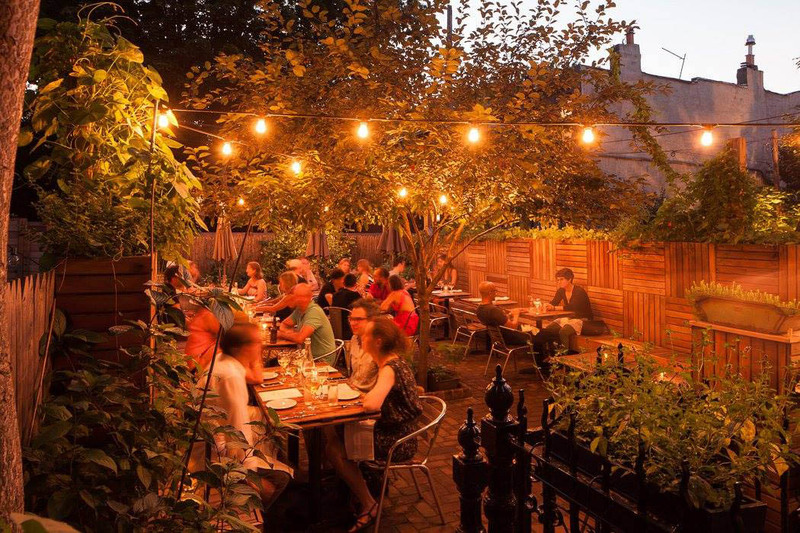 A lush and charming garden decked with bistro lights creates a wonderful ambiance to enjoy a delicious meal prepared by chef Brian Leth of Vinegar Hill House fame (also a veteran of Prune and Blue Hill). The Italian-accented menu features inventive ingredients and unique flavors. Your cocktails will likely be garnished with herbs directly from the restaurant’s garden, and all of the quality ingredients used for your meal are sourced from local purveyors who are committed to ecologically sustainable practices. Refreshingly, the service here is gratuity-free. This popular 3-story restaurant houses a rooftop garden, sidewalk café, market, cocktail bar, and open-air kitchen, all inside the rustic and sun-filled space formerly occupied by Isa. Chef Jaime Young (of Michelin-starred Atera) deftly prepares contemporary American cuisine with an ever-evolving menu and ambitiously aims to repurpose food waste, as evidenced by the “Yes, Whey” cocktail, which utilizes whey from onsite cheese-making, a martini that integrates juices from vegetable fermentation, and a hot pastry filled with ham scraps. 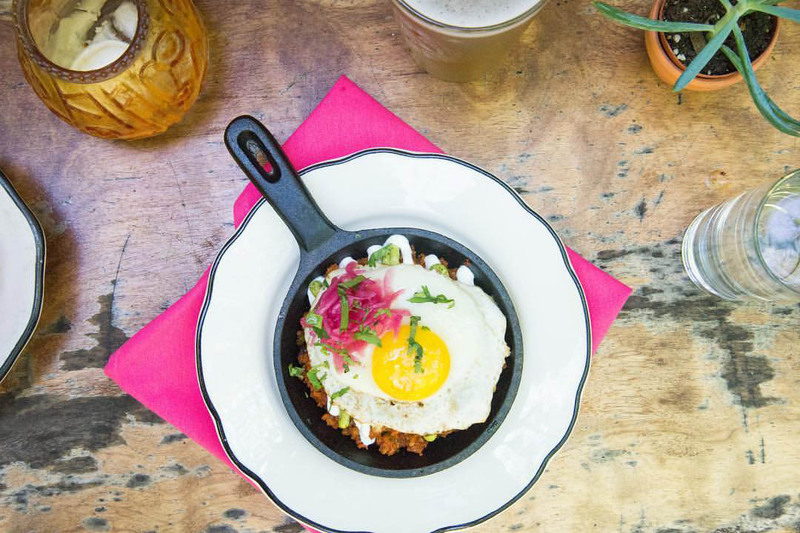 Brunch is their specialty, where you can opt for a healthy grain bowl and green juice or dig into the gooey deliciousness of malted pancakes or a warm pecan sticky bun and a “Care Bear Stare” cocktail served inside a honey jar. Bread is baked fresh daily in the wood-burning oven, and you can shop the market for house-made pickles, smoked fish, cured meat, and other specialties. This farm-to-table restaurant has been packed with happy customers from the day it opened its doors in 2006. The owners established this well-loved neighborhood staple on an enthusiastic whim, without any prior experience in the restaurant industry. Farm on Adderley is a South African expression that essentially means, “When pigs fly.” They were fortunate to link up with chef Tom Kearney, a veteran of Jean Georges, to create a wonderfully laid back, family-friendly spot with a community focus and a menu of fresh, seasonal and locally harvested, simply prepared dishes. This chic hot spot specializes in Oaxacan Mexican food with a twist and churns out delicious handmade masa, cheeses, chorizo, and moles. Meat and produce are organic and locally sourced. From the vine-covered backyard, you can watch tortillas being pressed and food being cooked on the wood-fired comal. A specialty is the yellowfin tostada with blood orange. The drink selection is centered on Mezcal – try the margarita with house mezcal, El Buho. A lovely, secluded back garden coupled with an all-natural slow food Italian menu provide a delightful brunch spot. You can also come here to enjoy fresh gelato with unique flavors like rose and rhubarb, olive oil, and arugula, or a full meal of homemade pastas and natural wines, artisanal cheeses, and salumi. Though it’s on bustling 5th Avenue, from the rear garden oasis you feel like you’re removed from city life. The staff and owners are welcoming, the space is family-friendly, and like the ethos of slow food, you won’t feel rushed. A verdant backyard situated just below the Brooklyn Bridge is a striking spot to enjoy authentic, simply delicious Mexican fare with thoughtfully sourced ingredients. The menu honors tradition and offers fresh, flavorful, tapas-style plates – fish tacos, tostadas, pork ribs, chile relleno, and amazing cocktails. For brunch, try the chilaquiles. 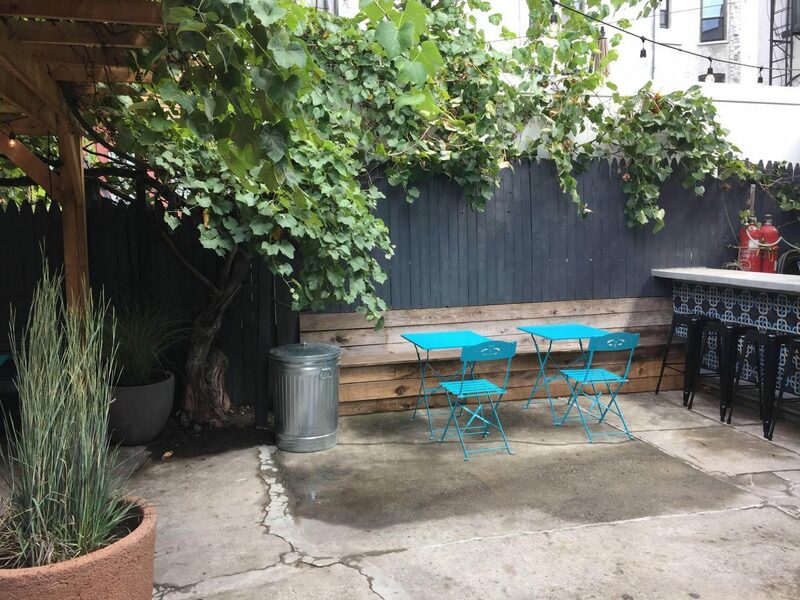 In 2004, “The Franks” established the first in their growing empire of Brooklyn culinary delights; Frankie’s is a quaint, rustic Italian spot with a charming backyard strung with bistro garden lights, offering consistently delicious seasonal food. Fresh, often organic ingredients are their focus and an easygoing Brooklyn vibe is what draws you back for more. The meatballs here are mandatory. They are also known for their house-made cavatelli with Faicco’s hot sausage and browned sage butter. Once a month, from late-April through October, visiting chefs come together in the backyard to create one-of-a-kind meals for Franks’ Backyard Chef Series. Chef Sohui Kim, who trained at Blue Hill and Annisa, and her husband Ben Schneider, a carpenter/actor/manager, turned their passion project into a reality in 2006 when they built this restaurant from the ground up. Dining here feels warm, inviting, and homespun, and the appealing garden only heightens the experience. The food is a vibrant mix of American flavors with Korean influences, and the small but eclectic menu bridges the gap between comfort food and fine dining through true attention to detail. Produce is sourced from a local Added Value Farm. Noteworthy selections are the pork and chive dumplings and steak and eggs. Vegetarian substitutions are offered, such as tahini-covered crispy tofu over kimchi rice in place of “steak and eggs.” For the dessert menu, they sweetly feature another local Red Hook favorite, Steve’s Authentic Key Lime Pie. Since 2009, Anella has evolved into an inviting and informal neighborhood spot with a knack for putting a fresh spin on upscale comfort food. To begin your meal, freshly-baked bread is served warm in flowerpots with salted butter. You can sit in comfort underneath the pergola in the backyard and check out the produce and herbs growing onsite. Regulars come back often to enjoy a focused and seasonally shifting menu. Highlights include simple pastas and a juicy skirt steak. Brunch in the garden doesn’t typically involve a huge wait, and the pork belly biscuit does not disappoint.